My sister is really clumsy. She’s always hurting herself by accident. Sometimes I worry about her. I’m sorry for spilling wine on your carpet. 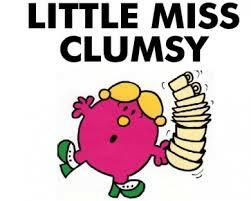 I’m so clumsy today. A: Who’s the clumsiest person in your family? B: It’s my father. My mother won’t let him wash the dishes now because he often drops the glasses. The artist’s earlier paintings are quite clumsy in comparison with his later work. Many of the sentences in your essay are clumsy and too long. I’d like you to rewrite them. The construction company got a bad reputation because they did clumsy work on many of their previous buildings. When we talk about a person being clumsy, sometimes it’s a general condition (as in the first and third example sentences), and sometimes it’s a temporary condition (as in the second example sentence). I think most people are clumsy sometimes, but only a few people are clumsy all the time.